Admit it. Your heart melts and you shed a tear whenever you watch that 2013 Budweiser Super Bowl ad that features a darling 3-week-old foal. Remember? The spot tells the story of the endearing bond between a Clydesdale and the trainer who raised him. Anheuser-Busch’s Twitter contest to name the baby generated more than 60,000 tweets, with Hope emerging as the winning name. Baby Hope is now a beautiful 3-year-old mare who is going to have a baby of her own early next year. And there is a real-life trainer, John Soto, who’s utterly devoted to Hope, as he is to every one of the majestic Clydesdales he tends. 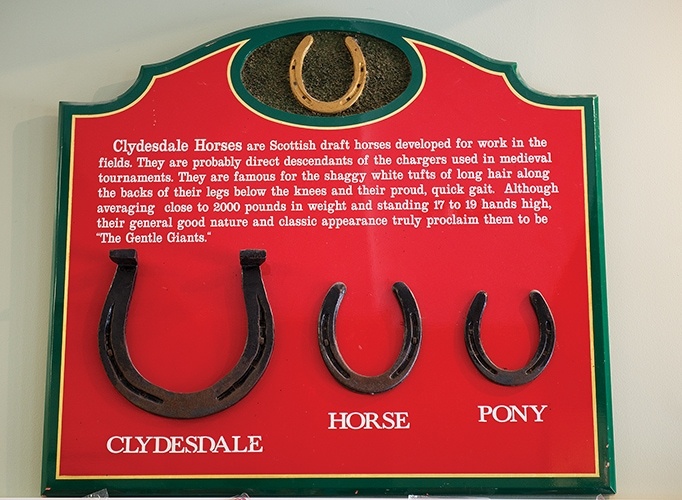 They all live just a few miles west of Columbia at Warm Springs Ranch, just off State Highway 98 outside of Boonville, where Anheuser-Busch’s Clydesdale breeding program has been based since 2008. Soto, the breeding farm supervisor, has worked with the Clydesdales for 37 years. He grew up helping his father raise and train thoroughbred racehorses on the West Coast and remembers his dad walking him over to meet the Clydesdales when he was just a little boy. Four months after he turned 21, Soto joined Anheuser-Busch. He laughs when he recalls that he came off the racetrack circuit only to get right back on; his first job was tending the team that pulled the starting gate at Santa Anita. From there, he traveled several years with the West Coast team, or “hitch” — “a different city nearly every day” in a territory spanning 13 Western states and western Canada. Soto left the hitch to start breaking colts at the West Coast ranch in Southern California, which opened in 1990 and augmented the Grant’s Farm breeding operation outside St. Louis. 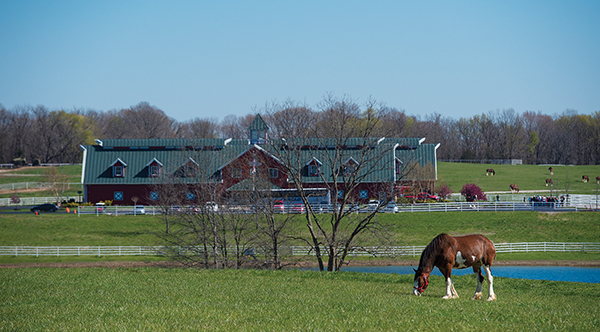 With nowhere to expand at Grant’s Farm, Anheuser-Busch eventually decided to consolidate its growing Clydesdale breeding program and chose a bucolic 340 acres of prime pastureland in mid-Missouri just off Interstate 70. The company completed the transfer of all breeding operations in October 2008 and now all breeding — and births— take place at Warm Springs Ranch, amid its picture-perfect setting of rolling green hills, handsome red barns and white fences. There are too many to have favorites, Soto says. “I like them all. Barney here, though, is a little over the top,” he says, maneuvering through a scrum of mares and foals as friendly and pushy as puppies. Barney, who needed Soto’s extra-special attention to learn to nurse and stand in the first weeks after birth, will not stop tugging on the sleeve of Soto’s jacket, just like any anxious toddler. Soto and his wife live on the property, and he attends every birth. 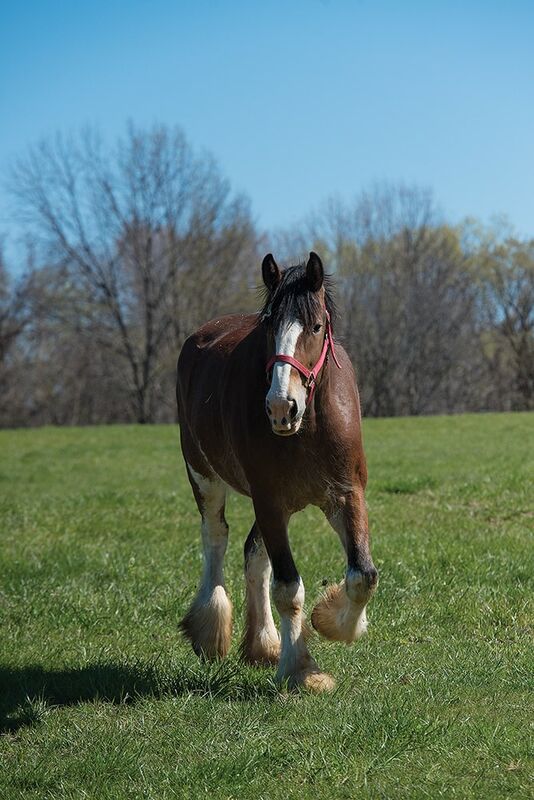 He guesses he’s helped bring all four generations of Clydesdales now at the farm into the world. Eight horses per hitch, traveling in teams of 10 horses to allow extras to rest and rotate in. Only male geldings go to the hitch. Foals are weaned at 5 months. Males with potential to go to the hitch are chosen according to eligibility standards. Years ago, August Busch Jr. set the standards for horses’ eligibility for the team:In addition to stature and strength, males must have four white legs; a bay (rich, dark brown) coat; a white face; dark tail. From 5 months to age 3, Clydesdales live at Grant’s Farm. At age 3, colts transfer to the Merrimack, N.H., training facility and East Coast Hitch base. In New Hampshire, horses are broken to harness and trained to drive with other horses. At age 4, Clydesdales go out on road, assigned to whatever hitch needs them. Most babies arrive between mid-January and June 1. A few births occur in September, so fall guests can see babies, too. Every horse eats 40–50 pounds of hay and roughly 8 pounds of grain each day. Their diet is supplemented with grass this time of year. A semi load of hay is delivered about once every three weeks. Two tours a day, limited to 65 people by reservations only, at 10 a.m. and 2 p.m.
Get reservations at www.warmspringsranch.com. They go quickly, particularly on weekends. “August Busch Jr. was a horse fanatic and so was his dad,” John Soto says. In 1933, at the repeal of Prohibition, Busch Jr. bought two teams of Clydesdales for his father, to haul the beer they could once again make and distribute. In a brilliant marketing play, a six-horse hitch of these majestic horses traveled by rail to New York, where they delivered one of the first cases of post-Prohibition Beer to New York Gov. Al Smith, who had been instrumental in repealing Prohibition. The hitch then traveled on to Washington, D.C., delivering another case to President Franklin D. Roosevelt at the White House. I love love your site! Hubby and I had one Clydesdale horse named Isabella (Belle) and enjoyed every minute with her. One of her baby’s did well. Won a State fair. All I have to do is learn how to send along the video not just the pic. So so glad I found you. Will be peeking in a lot.